After finishing our 15 hour drive from Los Alamos to Lone Pine, CA (we started the drive on Friday afternoon after work and camped near Flagstaff, AZ) we walked into the Mount Whitney Ranger Station in Lone Pine around 4pm to inquire about backcountry overnight permits for the North Fork of Lone Pine Creek trail to Iceberg Lake. With the day being the Saturday of Labor Day weekend, we were sure we'd be rejected as there are only four permits per day that are available for walk-ins and we had no advance reservations. However, with some great luck and some karma points cashed-in, there were two permits available for the next day. The ranger was as surprised as we were that permits were available. This was fantastic news for us as it meant we could start our climb the following day, Sunday, instead of having to wait until 11am on Sunday to attempt to get permits that would allow us to start our climb Monday. We were exactly on schedule. 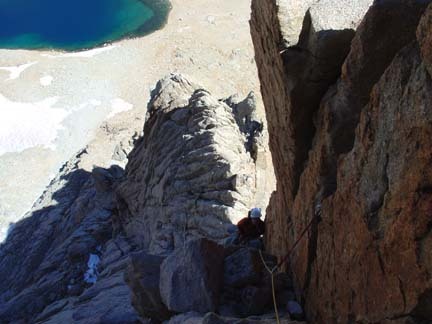 We got our permits for two nights of camping at Iceberg Lake so that we could climb the East Buttress on Mount Whitney the first day and then climb the Fishhook Arete on the neighboring 14er, Mount Russell, the second day. After elatedly leaving the ranger station Bill and I stopped at the local park to put our climbing rack together and pack our overnight packs. We then found a "dispersed camping site" on BLM land just west of Lone Pine along the Whitney Portal Road. Dispersed camping means free, no frills dirt camping. Just our style. We awoke at 5am to finish the drive up the Whitney Portal Road to the trailhead and get a start on the hike before it got too hot. The Whitney Portal trailhead is at 8,300' and much of the hike up to Iceberg Lake at 12,600' can be brutally hot due to a lack of trees along the east-facing trail. After stashing all our food and any other scented items in the big, communal, metal bear-proof lockers at the trailhead, we started hiking a little after 6:30am. A hanging weight scale at the trailhead confirmed our suspicions-after years of climbing we still don't pack light! Bill's pack weighed in at 46 pounds and mine was nearly 50 pounds. I suppose with all the climbing gear, rope and provisions for two nights, the weight wasn't that bad. For about the first mile we hiked along the main Whitney Portal trail bringing back memories of my first ascent of Mount Whitney in 1998 when we took a four day, three night backpacking trip along the west side of Mount Whitney and descended the Whitney Portal trail. 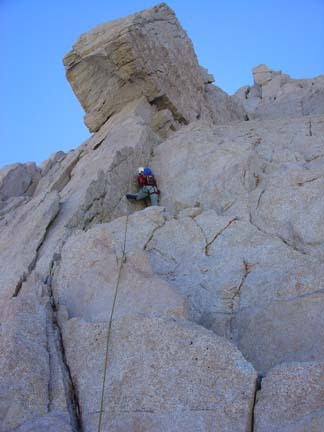 At that time I looked at the glorious, sheer east face of Mount Whitney and dreamt of someday climbing it. Finally, now seven years later, my opportunity had arrived. Bill had never been up Mount Whitney and was looking forward to a fun, technical route up the highest mountain in the lower 48 U.S. states. After about 20 minutes along the main Whitney trail, we came to the North Fork of Lone Pine Creek crossing the trail and turned right up the obvious climber's trail along the creek. We followed this trail through nicely wooded (and shaded) terrain along the creek before reaching the granite "Ebersbacher Ledges" section of the hike. 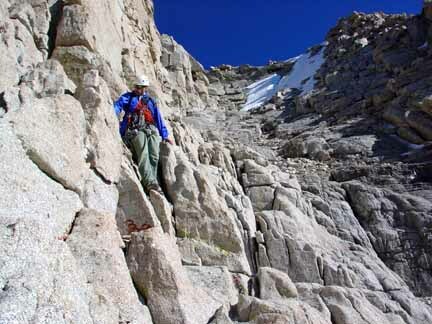 Using a combination of our route-finding skills and the SuperTopo guide for Mount Whitney/Mount Russell, we managed our way up through these third-class ledges without issue and soon found ourselves at the Lower Boy Scout Lake. From here it would be more granite slab hiking and some loose dirt/talus scrambling up past Upper Boy Scout Lake and to our camp at Iceberg Lake. We arrived at Iceberg Lake at 10:40am. Surprisingly, the area wasn't crowded and we found a nice campsite with good rock walls for protection from the non-existent winds. It was a beautiful, cloudless day. We only noticed three other parties camping at the lake. 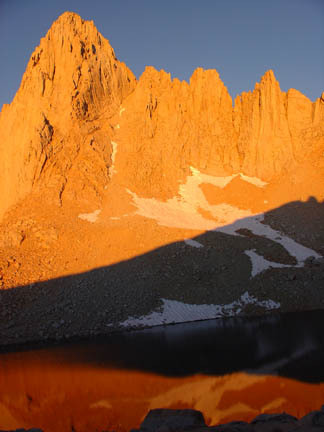 From our campsite we could see the intimidating east face and east buttress of Mount Whitney looming above us. We setup camp in short order and decided the day was young enough for us to climb the East Buttress that afternoon. We saw only one other party on the route at the moment and they were already starting the second pitch so we didn't anticipate having to wait for anyone on the route. We racked up and started scrambling up the lower "Mountaineers Route" to the base of the East Buttress route. By 12:20pm we were flaking the rope and Bill was tied in ready to lead. The first pitch goes at 5.6 through a shallow dihedral with a steep finish to a nice belay ledge. We were both impressed with the quality of the granite rock here and were already wishing we had rock like this in New Mexico! As Bill setup his belay anchor and put me on belay, I thought about how excited I was to be climbing this wonderful rock on this wonderful route and the icing on the cake was this route would be the first of many during our two-week trip in the Sierras! Bill leading the initial pitch of the East Buttress route. The first pitch went smoothly for both of us and I lead the second pitch with some easy traversing on the buttress' north side to a sunny and airy belay on the buttress proper. 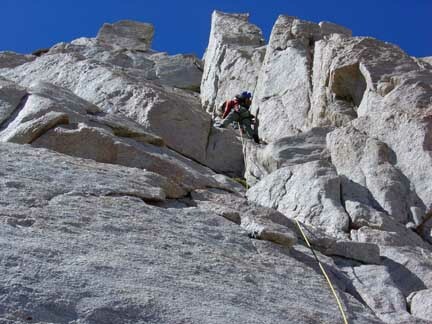 During the second pitch one begins to feel the exposure of climbing on the buttress and it was awesome. Iceberg Lake appeared to grow smaller as we ascended. Bill followed the second pitch and started the third pitch. The third pitch involved some fun 5.7 face climbing that wasn't easily protectable. Bill passed an old piton but it was so beat up, he couldn't fit a carabiner through the hole and skipped it. Bill ended the pitch just below the "red corner" so I got to lead this section on pitch four. It was some nice 5.6 climbing but only for a few moves before easier ground was encountered and I completed the pitch with a rope-stretching pitch (I believe we simulclimbed for a short bit) to reach the large ledge just below "The Peewee" block. Looking down the "Red Corner" section of pitch 4. Bill lead pitch five up some fun 5.5 face climbing with a very short chimney to the next belay ledge. Bill leading on pitch 5 below "The Peewee". This left me with the 5.7 fingers climbing which was steep and airy but not difficult. The cracks in the granite were awesome and very positive making for enjoyable, secure climbing. By this time though, it was after 3pm and we were in the shade so the rock was cooling off fast. I finished my pitch just below a short chimney that looked to have fun face climbing above. Bill got that pitch and made the short chimney moves look easy and made fast time up the rest of the pitch to a large belay ledge in the sun. Motivated to be sitting in the sun again, I followed quickly as the climbing became increasingly easier. Once we were both on the sunny ledge we took time to enjoy the view and snack a bit before finishing off the climb as we expected a good number of people to be on the summit and wanted to enjoy the solitude just above the great east face. We had a fantastic view of the Fishhook Arête on Mount Russell to the north of us. We planned to climb that arête the following day and it was great to preview the route a bit. As the sun began to disappear we decided it was time to finish the climb. The climbing looked easier for the last pitch, so we coiled the rope and scrambled up the fourth class rock with the occasional low fifth class move to the summit at 4:00pm. There weren't nearly as many people as we expected on the summit. One guy had a tent setup for the evening and we talked to another group of three that were at the tail end of the John Muir Trail through-hike and were sleeping in the large, rock summit hut for their last night. A large, lightning-caused fire was burning to the northwest in the Kings Canyon National Park but the smoke was staying north of us for the most part so the views were still fantastic. After spending about 40 minutes on the summit, we decided it was time to head down. We hiked north and west on the summit to find the Mountaineer's Route as our descent route. This route is a 3rd and 4th class route with plenty of loose rock. The initial slabs leading down into the couloir had our attention with some short friction moves and big down-steps but once we were got down into the couloir, it was just a matter of paying close attention and taking careful steps so as to not kick rocks down. After about two hours of focus while descending, we arrived back at the tent at Iceberg Lake. Our camp neighbors had some hot potato soup leftover and gave it to us when we passed by their camp. How awesome to climb an enjoyable, challenging route on California's highest mountain and come back down to hot soup ready for eating! After polishing off their leftover soup, we cooked up a dehydrated meal of our own and settled into our sleeping bags to reflect on the climb and dream of our next day's climb of Mount Russell.